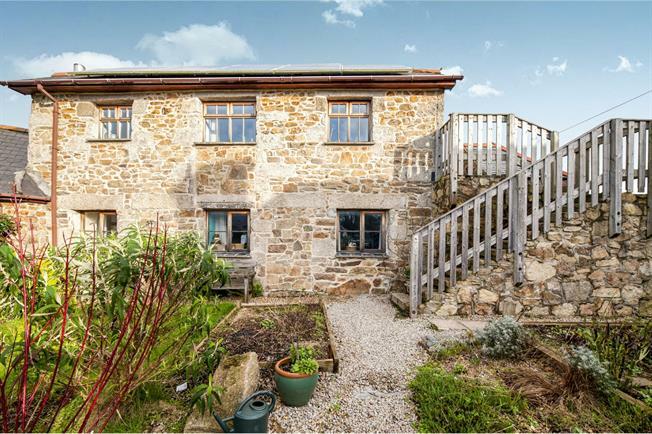 4 Bedroom Semi Detached House For Sale in Marazion for Guide Price £385,000. This beautifully converted barn simply has it all and comprises; open plan lounge, dining area and kitchen on the first floor, with four bedrooms (one with en suite and French doors opening out onto the garden) utility area, conservatory and family shower room on the ground floor. Outside there is a balcony with countryside views, fully enclosed garden and private parking for three vehicles. There is also a detached workshop/studio with power. Double glazed French doors opening into lounge area with triple aspect double glazed windows to front, rear and side, with countryside views. Bamboo flooring and multi fuel stove with slate hearth. Double glazed window to front aspect, bamboo flooring and space for dining table. Two double glazed windows to front and rear aspect with countryside views. Bamboo flooring, range of bespoke base and wall kitchen units with solid oak worktops, integrated electric double oven and 90cm halogen hob, plentiful storage and breakfast bar. Range of walk in wardrobes, tiled flooring with under floor heating. French doors opening out onto the rear garden. Double glazed window to side aspect, door to en suite shower room. Spacious bathroom with obscure window, large double shower cubicle, W.C and wash hand basin. Under floor heating. Double glazed window to front aspect. Electric radiator. Dual aspect double glazed windows to front and rear aspect. Electric radiator and double wardrobe with hanging rail. Fully UPVC double glazed room with exposed granite wall and views over the garden, electric radiator and tiled flooring. Double glazed window to rear, space and plumbing for washing machine. Double glazed window to rear aspect, double shower cubicle with electric shower, W.C, wash hand basin and heated towel rail. From the first floor you can access the spacious balcony which encompasses stunning far reaching countryside views. There is also a fully enclosed mostly laid to lawn rear garden with detached workshop (with power and lighting). The front is gravelled for low maintenance and hosts three parking spaces.